Remove the old inner shift wire and install a new one. Shift cable inner wires wear out over time. Other than obvious fraying, rust or visual wear, you can tell your cables are worn when your shifting starts to feel sluggish. If lubricating the housings or shift levers doesn’t help, they’ll likely need replacing. For this job, you’ll need a replacement shift cable inner wire. Shift cable ends have a cylinder barrel shape as shown here. I recommend stainless steel cables if you’re riding regularly in a wet climate, as they won’t rust. You’ll need a good set of wire cutters, some bicycle specific cable cutters if you’ll be replacing the outer cable housing, and some triflow or light lubricant. You’ll need either a 9 or 10mm metric open end wrench or a 5 or 6mm hex key for the derailleur’s cable pinch bolt. You’ll also need to know how to adjust your front or rear derailleur, as explained in previous tutorials. The first step is to relieve cable tension by shifting your derailleur so the chain is on the smallest sprocket on either your front or rear derailleur. Carefully observe how your cable is presently routed from the shift lever to your derailleur. A misrouted cable can cause many problems. It may help to photograph each section of the cable from the shifter to the derailleur so you can use it for reference. Your derailleur may not look exactly like the one pictured here, but the concepts will be the same. Now disconnect the cable at the derailleur’s pinch bolt. Notice how the cable is flattened where it was pinched. I like to cut the cable just before this part so it is easier to remove by sliding through the outer cable housings. I recommend replacing the outer cable housings at the same time. See the tutorial titled “How to Replace Cable Housings”. Once you have nothing but the shift lever and the cable left, push the cable gently until you see the head poke out of the lever. Now you can pull it the rest of the way until it is completely removed. Depending on what type of shifters you have, reinserting the new cable can be tricky. I like to give the end of the cable a slight bend to help guide it through. If it meets resistance, try rotating the cable a little bit and gently pushing until it slides all the way through. If your shifter has a barrel adjuster, turn it clockwise all the way and then back it off one full turn. Drop some light oil into your cable housings and make sure the outer housing’s cable ferrules are firmly in place before carefully sliding the new cable through the housing. If your derailleur has a barrel adjuster, tighten it all the way clockwise and then back it off one full turn. Then route your cable the same way it was before and thread the inner cable under the derailleur’s pinch bolt washer. Often there is a groove on the derailleur where the cable is meant to sit. Pull the cable tight and tighten the pinch bolt. The cable will flatten when tightened. Always tighten bolts to the manufacturer’s torque specifications. Adjust the derailleur as needed. 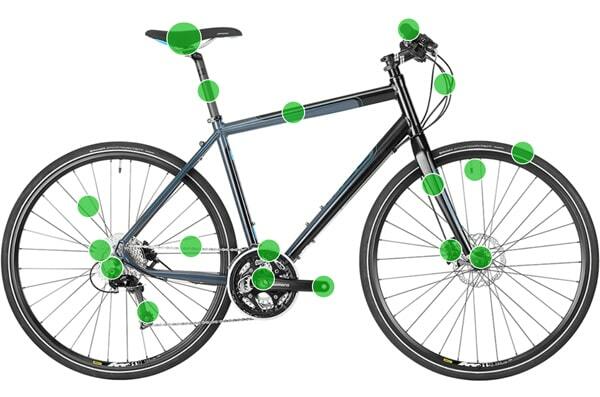 See the related tutorials for tips on adjusting derailleurs. Once installed and adjusted, cut the wire about 2 inches further along the cable. Your new cable should have come with a cable end that can be gently crimped on using wire cutters or pliers. This will prevent fraying. Difference between galvanised and stainless steel cables? Difference between galvanised & stainless steel cables? What does PE lined brake cable mean? Shift cables and front derailer messed up.